Bats that have been preventing staff at a hydro power station in the Highlands from using their new canteen building are to be relocated. 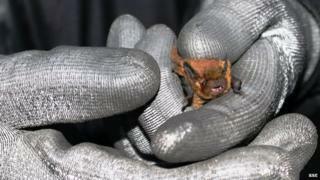 Workers at the Invergarry site have not used the purpose-built mess building for three years after more than 500 soprano pipistrelle bats moved in. Bats are protected and special permissions are needed to handle them. SSE's biologist Alastair Stephen and ecologist Robert Bell hope to lure the creatures to alternative homes nearby. The tiny bats use the recently-constructed mess building close to the 20MW hydro scheme as a summer roost, crawling through small spaces to sleep behind walls and in the roof. The 12 staff have been unable to use the building in summer because of the smell of ammonia given off by the animals' droppings. The workers have been taking their breaks in hired temporary accommodation. However, SSE said this was proving to be an expensive and unsustainable long-term solution. After securing a licence from Scottish Natural Heritage, Mr Stephen and Mr Bell have started work in arranging alternative roost sites. These include bat boxes and the building of a small hut on the nearby shores of Loch Oich. The bats' smelly droppings will be used to lure the creatures to these sites. Over the winter, the bats' access to the mess building will be sealed off. The work will not affect brown long-eared bats which roost in roof space not used by the pipistrelles. Mr Stephen said: "A key priority for us is to ensure the bats are relocated safely and without disruption to their natural behavioural patterns. "SSE has enlisted the help of SNH and Robert Bell from Ecus Consulting to advise on and manage all aspects of the procedure." Bat ecologist Mr Bell believes the colony of pipistrelles to be one of the largest in Scotland. He said: "Bats comprise a range of hugely important species worldwide and protective legislation of the highest level rightly exists across the UK to protect this unique mammal, which has suffered historic declines in abundance. "Scotland tends to have larger roosts than England - it's not really known why but is likely to do with either differing weather conditions or a lack of roosting opportunities. "Much is still unknown about the mysterious behaviour of bats and surveys being undertaken at Invergarry help us understand the character of the existing bat roost in order to design an effective mitigation approach for this species."